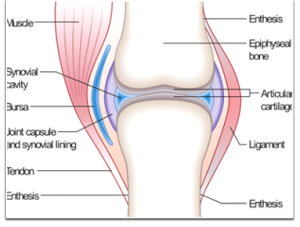 Fibrous (immovable) – joints are held together by intervening fibrous tissue, and there is no appreciable movement. Such as bones of the cranium/skull. Cartilaginous (slightly movable) – the opposed bony joints are covered with hyaline cartilage and are either connected to each other by a broad flattened disc of fibrocartilage, or are united by an interosseous ligament. This connection allows for a limited amount of movement, such as joints between vertebral bodies.